“This is a dream come true for the boys,” he said of their historic victory. New Caledonia dominated their match from the outset but at the same time were a little bit lucky to scrape through with 3-2 victory as Vanuatu made a stunning comeback in the final ten minutes of the earlier match. Something coach Michel Clarque doesn’t want to see happen again now that his side is through to an all-important semi-final. “This was a very important match for us – either we go home or we do something. Luckily we scored,” he said of his team’s efforts. The decision to switch the matches to Stade Pater, due to adverse weather conditions affecting the field at Mahina didn’t seem to faze either side as they adapted well to their grander surroundings. Nippy striker Raymond Luewadria and Lionel Thahnaena were confident in possession, driving through their opponent’s backline and keeping Vanuatu’s goalkeeper Dgen Leo busy. After some sustained pressure from New Caledonia they eventually got their lead in the 37th minute when Lionel Thahnaena scored a brilliant solo effort, weaving past several defenders before smashing past Leo. As the match ticked over to the 70th minute things came together nicely for the mini-Cagous who as substitute Paul Gope-Fenepej was left unmarked at the near post to head home a corner. Two minutes later referee George Time was pointing to the penalty spot after Vita Longue was brought down by the keeper. Bernard Iwa stepped up drilling low and to the left of an outstretched Leo to take the score to 3-0. 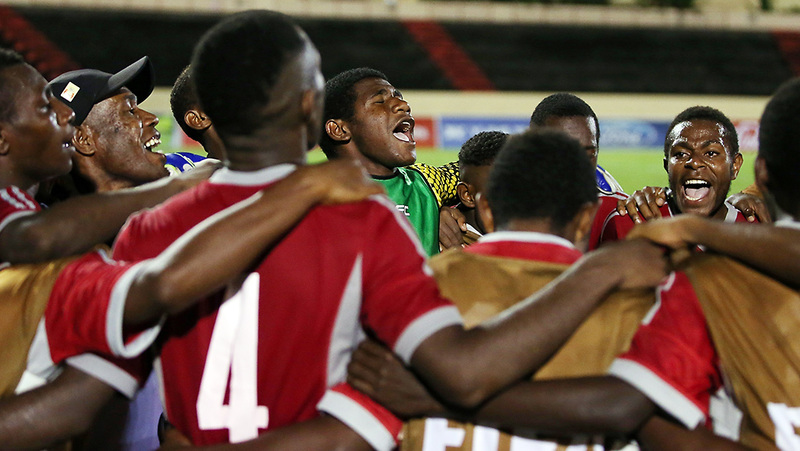 Celebrations were short-lived however as New Caledonia seemed to implode in the final ten minutes giving Vanuatu a chance to get back in the match. Subtitute Jayson Tari was the first to damage his opponent’s clean sheet when he fired in a stunner in the 84th minute. The referee was then pointing to the penalty spot for the second time in the half after the ball was handled in the box. Abert Vanva got behind the ball and fired wide, but Vanuatu had a second chance when Time demanded a retake after the keeper Une Kecine moved too early from his line. Captain Rhydley Napau took over from his teammate and battered the ball past the keeper to bring his side just one goal from an equaliser. Despite their best efforts as the match entered additional time, it wasn’t to be and New Caledonia scrapped through with a win to secure their semi-final berth. “I don’t have any regrets about this match at all,” Vanuatu coach Rocky Neveserveth said. “We are fortunate to be able to come here and compete and also to learn. Clarque was quick to credit New Caledonia’s opponent and the obvious skills the players possess. “Vanuatu is such a difficult side to interpret. When you play a team like New Zealand or Tahtii everything is by the book, we know relatively, how they are going to play,” he said.